After visiting the Christian Fields Local Nature Reserve, it seemed a good time to revisit the story that gave a name to the immediate area, and according to some, to the wider city as well. Legend has it that in around 300AD, one thousand (or 999 depending on which version you read) Christians were massacred by a Roman army and their bodies left unburied in a place that would become known as the ‘Field of Corpses’ aka Lichfield (from the OE lic – body/corpse). From 1548, versions of this story were depicted on the city seal, examples of which can still be seen in several places across the city, including the Martyrs Plaque at Beacon Park, 19thc police badges on display in the City Gaol, and in the main hall at the Guildhall. Several fairly obvious locations in the city have been mooted as possibilities for the specific location of the massacre, including Borrowcop Hill, St Michael’s Churchyard and the site of the Cathedral. However, what was it about this parcel of land, a mile north of the Cathedral that convinced people to such an extent, that it was given the name ‘Christian Fields’? In the 17th-century the antiquarian Robert Plot declared that the area, now known as Christian Fields, had been the site of the martyrdom and it has born the name ever since. Needless to say Robert Plot’s claim has never been substantiated and no archaeological evidence has ever been presented in its support. Looking at John Speed’s 1610 map of the city, I wonder whether the idea that the massacre took place at Christian Fields actually pre-dates Robert Plot? At the end of a road leading north from the Cathedral (possibly Dimbles Lane? ), in the vicinity of Christian Fields, is an illustration depicting a scene that looks like a representation of the legend, similar to that found on the city seal. In a meadow adjoining CHRISTIAN FIELDS, known by the name of the TOAD’S HOLE PIECE, have been recently found a considerable quantity of human bones, various pieces of earthenware, some of which are Roman, a stone bowl or dish perhaps used for grinding corn, a stone ball, fragments of weapons including the head of a pike or halberd and several horseshoes pierced for nails at the top as well as the sides. The objects were discovered nearly four feet below the surface in a peaty soil, amongst and covered by great quantities of roots and decaying branches. I found the book (1) on googlebooks and found it contained illustrations of the objects. The articles of which I have sent you drawings were found near some land known by the singular names of Hic Filius and Christian’s field so called, according to tradition, from having been the place where the early converts to Christianity had used to assemble and where the massacre from which Lichfield derives its name took place. The letter goes on to describe what I think are these drawings from the Staffordshire Past Track site. – “a stone dish one foot diameter used perhaps for grinding was placed in the earth as a cover for a smooth red earthenware broken by the eagerness of the workmen to examine the contents (proved earth only). The black spots arc metallic. Also, the head of a weapon in preservation the wooden staff was broken off near the head, the iron is 21 inches in length. There are also weapons found in 1817 in the foundation of one of the canons houses on the North side of the Close with some bones and broken armour”. I’m not suggesting that the objects are proof of the legend, which along with the ‘Field of the Dead’ explanation of the place name of Lichfield is generally accepted to be untrue (the current favoured explanation of the name is ‘the common pasture in or beside the the grey wood). However, and I may be reading into things too much here, I do think it’s a little curious that these items seem to almost be a tick list of props for the martyrs’ story…. Bones? Check. Horses & weapons? Check. A link to the Romans? Check. The question I’m finding it hard to find an answer to is, if it’s agreed that these objects aren’t part of the story of the Christian Martyrs, in some way, shape or form, then whose story or stories are they part of? About three quarters of a mile from (St Chad’s Well) are Hic filiius and Christians Fields where the converts of Ampbibalus are said to have been massacred; a considerable quantity of human bones have been found in the adjoining fields a few feet beneath the surface. It has been the custom of civilized nations to collect and burn or bury the bodies of those slain in battle here fragments of bones are found scattered through a space exceeding half a mile and in one place only have they been met with under the appearance of having been buried which was in a field near Pones mill on the east side of the brook these had probably been dug up and thrown into an excavation as were several cart loads found in the field adjoining to that in which the earthen ware before noticed was discovered which were thrown into a marl pit near the spot. Tradition says the bodies of the massacred christians were left unburied a prey to the birds and beasts of the forest. 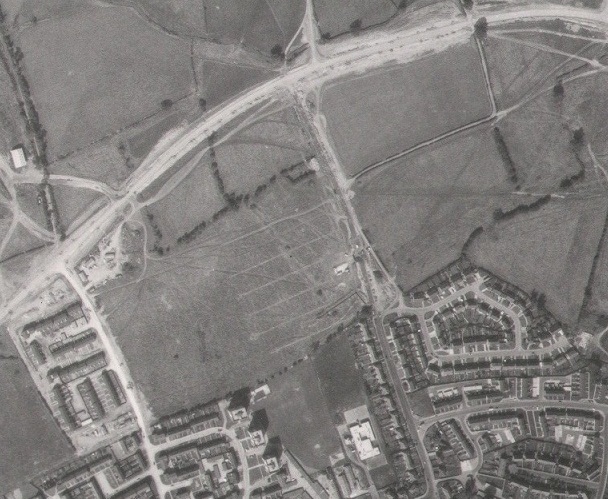 On maps from the later 1800s, there is a marl pit in the corner of the field marked as ‘Christian Fields’. 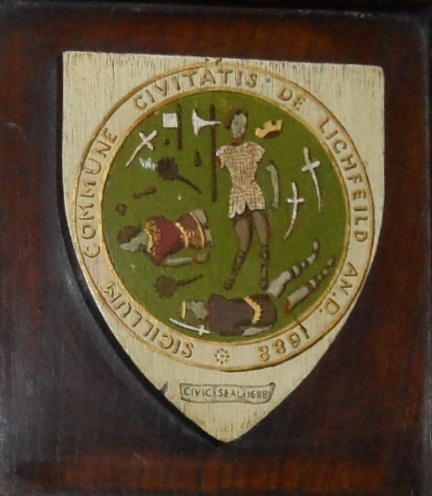 This entry was posted in archaeology, Christian Fields, dig, Elmhurst, gaol, guildhall, legends, Lichfield, maps, martyrs, placenames, St Michael, staffordshire, stories and tagged archaeology, bones, Borrowcop, Christian Fields, christians, City Seal, Elmhurst, Field of the Dead, finds, Lichfield, martyrs. martyrs plaque, place names, Robert Plot, romans, Saints, seal, St Michaels by Kate. Bookmark the permalink. Wherever they are buried (if ever they existed) is, almost inevitably, under a car park. One of our car parks was just dug up funnily enough. As far as I know no kings or martyrs were uncovered unfortunately! Me and my dad came up with the pasture by a grey wood months ago, we never felt the field of corpses was quite right so after a little digging we managed to put a few clues together and cme up with that, this was without any prior knowledge. That’s great, I think that the study of place names is fascinating & important. I think, as you’ve shown, that it is really important to question things rather than just accept the information given. do I for one look forward to reading your blog. Thanks Pat. I agree that it’s not just this grand and dramatic history that needs to be collected, fascinating though it is, but the everyday & ordinary things too. There’s a group on Facebook doing already doing some work on this part of Lichfield history (I think they plan to produce a book) but it’s something I’d like to do more on, if I had the time. Kate, I have to agree another excellent blog and the theme of many stories and theories. I have heard the stories and evidence that was collected near to what has been described as ” Christian Fields”. However, I have heard that the site of the massacre was near to Pipe Green also. In the past I was told that the fort site near to the Abnalls Lane was where the bodies were buried. It’s quite fascinating to consider that Saint Amphibalus was venerated as a Christian Priest and once sheltered St Alban. Coincidence maybe, if you rearrange “Abnalls” you can get “S Allban”??? I would be interested to hear more in the future about this history. Thank you in the meantime. Thanks. It’s a fascinating story and has been the subject of much debate over the years! I would be very interested to know what happened to the archaeology from near the Christian Fields site. I’d also like to know more about the Abnalls Lane site, I know it’s a scheduled ancient monument but don’t know what, if any, investigations have ever taken place there.